Music Theory Games are about to change how your students feel about music theory. Sometimes teaching music theory is like teaching children to eat their vegetables. They know it’s good for them, they just don’t think it’s very exciting… until now… with the Ultimate Music Theory Games Pack. Imagine how much fun you will have when you Play, Laugh and Learn with the Ultimate Music Theory Games Pack. 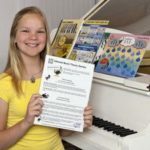 I love teaching music theory… because that’s what helps students become successful musicians – knowing how to read the language of music with great sight reading and ear training skills. Now it’s time to make teaching music theory even more fun with the Ultimate Music Theory Games created by Joanne Barker UMTC. Music Theory Games make learning and teaching more fun. Ultimate Music Theory Games – Watch now. Ultimate Music Theory Games – Play, Laugh & Learn! 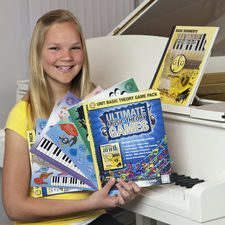 The UMT Basic Theory Games Pack includes 6 Individual Laminated Music Theory Games that are the perfect 9 X 12 size. Each of the 6 UMT Games has specific instructions written on the back; for 6 ways to play each game which equals 36 different Plays. PLUS the UMT Games Pack includes 2 Free Bonus Posters – Basic Music Theory Guide and Basic Music Theory Chart. UMT Games may be played as part of each lesson for a quick review of music theory concepts. UMT Games may be played at the table with a roll of the dice or using dry-erase markers. UMT Games may be played at the piano to develop strong Ear Training & Sight Reading Skills. UMT Games contribute to accelerated learning in all 3 modalities – Visual, Auditory & Kinesthetic. Imagine how much fun you will have when you Play, Laugh & Learn with the UMT Basic Theory Game Pack! Till Next Time… Teach with Passion!